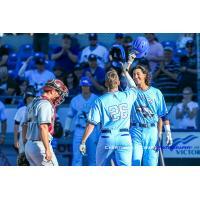 2017 WCL All-Star and returnee Hunter Vansau didn't wait long to make his presence felt, hitting the very first pitch he saw over the right field fence for a two-run home run, propelling the HarbourCats to an eventual 6-3 win over the Bend Elks in West Coast League action Wednesday night at Wilson's Group Stadium at Royal Athletic Park in Victoria. 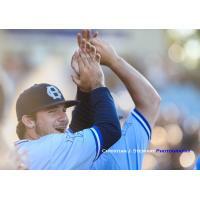 The win was the second in a row for the HarbourCats over the struggling Elks and gives the HarbourCats the series win, with a chance to go for the sweep in Thursday night's finale. Vansau, along with fellow teammate Rowdey Jordan, both helped the Mississippi State Bulldogs reach the semi-finals of the 2018 NCAA World Series, with both arriving in Victoria earlier this week. 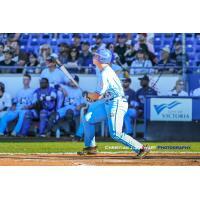 While Jordan has not yet seen action, Vansau was put into tonight's lineup and wasted no time making his first inning contribution, eventually finishing the night with two hits and three RBI. Mason Shaw started his fourth game of the season on the mound, and after going five innings in a victory against his hometown team in Bellingham last start, the righty from Ferndale, WA was effective all night. Shaw would retire the Elks in order in the first, and finish one inning away from qualifying for his first quality start, firing five shutouts innings of two-hit ball with six strikeouts in his second victory on the season. Meanwhile, on the opposing bump Elks team leader in strikeouts (25), Khalil Rivera got the call for Alan Embree's squad and would not be able to replicate his last winning performance July 4 in Walla Walla. 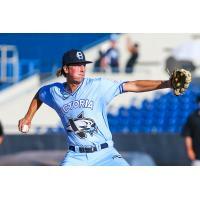 Despite adding five strikeouts to his team lead, the HarbourCats would add a run to their lead in the third off the right hander. Dustin Demeter hustled for a one-out double, and after advancing to third off a Jeddediah Fagg single, would be sent home when Rivera was called for a balk. Adam Imwalle and Joe Casey both recorded matching singles in the fourth, and Nick Plaia would hit the third single of the inning to score Imwalle. The RBI single was Plaia's eighth on the year so far. Coming up for his third at-bat, Vansau collected his third RBI of the night hustling for an infield single which scored Plaia and increased the HarbourCat lead to five. After Bend plated one run in the top half of the seventh, Mike Malinchak responded in the home half with a RBI fielders choice of his own to get the Victoria lead back up to five. Last night's hero, and 2018 All-Star Jedd Fagg continued to be dialed in at the plate, finishing three for three to up his season batting average to .326. The Elks scored once again in the eighth and loaded the bases off reliever Ping-Chun Ho, but the righty out of Barry University would strike out Brandon Leitgeb to end the threat. Ho returned for the ninth, and would give up one more run before retiring the side to close out the Elks. Victoria out-hit Bend 11-7 on the evening, and will call on Tyler Hilton tomorrow night in hopes of getting the series sweep and bringing their Second Half record back up to the .500 mark. 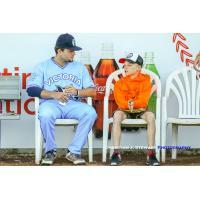 First pitch is scheduled for 6:35pm at Wilson's Group Stadium at Royal Athletic Park.